For traveler tips, more things to do, other places to visit, and tourist information, refer to the Oklahoma City trip planner . Jersey City to Oklahoma City is an approximately 5.5-hour combination of train, bus, and flight. You can also do a combination of train and flight; or drive. The time zone difference moving from Eastern Standard Time to Central Standard Time is minus 1 hour. Traveling from Jersey City in December, plan for a bit cooler nights in Oklahoma City, with lows around 31°F. You will leave for Denver on the 17th (Mon). 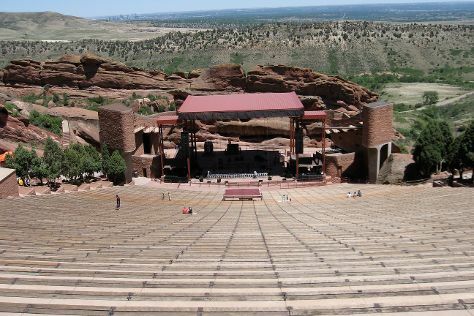 You've now added Red Rocks Park and Amphitheatre to your itinerary. Kick off your visit on the 17th (Mon): catch a live performance at Red Rocks Park and Amphitheatre. To see reviews, ratings, traveler tips, and tourist information, you can read our Denver trip planner. Do a combination of flight and train from Oklahoma City to Denver in 4.5 hours. Alternatively, you can do a combination of car, flight, and train; or drive. The time zone changes from Central Standard Time (CST) to Mountain Standard Time (MST), which is usually a -1 hour difference. Plan for a bit cooler temperatures traveling from Oklahoma City in December, with highs in Denver at 43°F and lows at 19°F. Cap off your sightseeing on the 17th (Mon) early enough to go by car to Vail. Keystone is a census-designated place (CDP) in Summit County, Colorado, United States. Keystone Ski Area has been added to your itinerary. For maps, reviews, ratings, and other tourist information, read Keystone visit planning tool . Drive from Denver to Keystone in 2 hours. Alternatively, you can do a combination of bus and shuttle; or do a combination of train and bus. When traveling from Denver in December, plan for cooler days and slightly colder nights in Keystone: temperatures range from 17°F by day to 6°F at night. You will have some time to spend on the 19th (Wed) before leaving for Arches National Park. Your day-by-day itinerary now includes Delicate Arch as well as Tower Arch. Start off your visit on the 19th (Wed): take in the dramatic natural features at Double Arch, explore the striking landscape at Tower Arch, and then don't miss a visit to Delicate Arch. To find maps, other places to visit, reviews, and other tourist information, read Arches National Park route planning website . Do a combination of shuttle, flight, and taxi from Keystone to Arches National Park in 5 hours. Alternatively, you can drive; or do a combination of shuttle, flight, and car. When traveling from Keystone in December, plan for warmer days and somewhat warmer nights in Arches National Park: temperatures range from 38°F by day to 15°F at night. Finish your sightseeing early on the 19th (Wed) to allow enough time to drive to Monument Valley. Monument Valley is a region of the Colorado Plateau characterized by a cluster of vast sandstone buttes, the largest reaching 1000ft above the valley floor. To find more things to do, where to stay, traveler tips, and tourist information, go to the Monument Valley trip itinerary maker app . You can drive from Arches National Park to Monument Valley in 4 hours. In December, plan for daily highs up to 41°F, and evening lows to 20°F. On the 19th (Wed), you'll travel to Page. 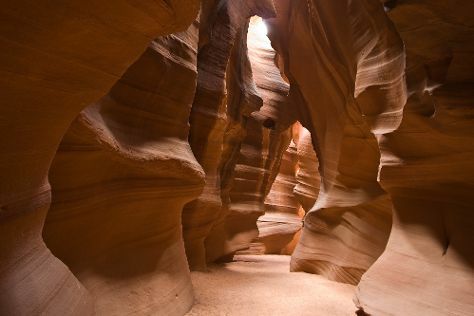 Your day-by-day itinerary now includes Antelope Canyon, Horseshoe Bend and Glen Canyon National Recreation Area. On the 20th (Thu), take in the dramatic natural features at Horseshoe Bend, take in breathtaking views at Antelope Canyon, and then look for all kinds of wild species at Glen Canyon National Recreation Area. To see ratings, other places to visit, and other tourist information, refer to the Page road trip planning tool . Drive from Monument Valley to Page in 2.5 hours. Plan for somewhat warmer temperatures traveling from Monument Valley in December, with highs in Page at 47°F and lows at 30°F. Wrap up your sightseeing by early afternoon on the 20th (Thu) to allow enough time to drive to Grand Canyon National Park. Your day-by-day itinerary now includes Mather Point, Navajo Point and Lipan Point. To find other places to visit, maps, reviews, and tourist information, use the Grand Canyon National Park trip planning app . Drive from Page to Grand Canyon National Park in 2.5 hours. Traveling from Page in December, plan for little chillier nights in Grand Canyon National Park, with lows around 15°F. Wrap up your sightseeing by early afternoon on the 21st (Fri) to allow time for travel to Las Vegas. Plan a trip to Las Vegas easily and quickly by telling Inspirock to suggest an itinerary. Traveling by combination of flight and car from Grand Canyon National Park to Las Vegas takes 4.5 hours. Alternatively, you can drive; or take a shuttle. The time zone difference moving from Mountain Standard Time to Pacific Standard Time is minus 1 hour. When traveling from Grand Canyon National Park in December, plan for somewhat warmer days and much hotter nights in Las Vegas: temperatures range from 57°F by day to 39°F at night. Finish up your sightseeing early on the 22nd (Sat) so you can go by car to Sequoia and Kings Canyon National Park. For other places to visit, more things to do, maps, and tourist information, read Sequoia and Kings Canyon National Park trip itinerary maker app . Traveling by car from Las Vegas to Sequoia and Kings Canyon National Park takes 8 hours. In December, plan for daily highs up to 58°F, and evening lows to 36°F. On the 23rd (Sun), you're off toYosemite National Park. Your list of things to see and do now includes Nevada Falls Loop, Half Dome, Valley View, and other attractions. Start off your visit on the 24th (Mon): trek along Nevada Falls Loop, then take in the dramatic natural features at Half Dome, then make a trip to Valley View, and finally explore the striking landscape at El Capitan. To see other places to visit, maps, reviews, and other tourist information, go to the Yosemite National Park online trip builder . Getting from Sequoia and Kings Canyon National Park to Yosemite National Park by car takes about 5 hours. Expect a bit cooler weather when traveling from Sequoia and Kings Canyon National Park in December: highs in Yosemite National Park hover around 46°F, while lows dip to 14°F. Cap off your sightseeing on the 24th (Mon) early enough to go by car to San Francisco. 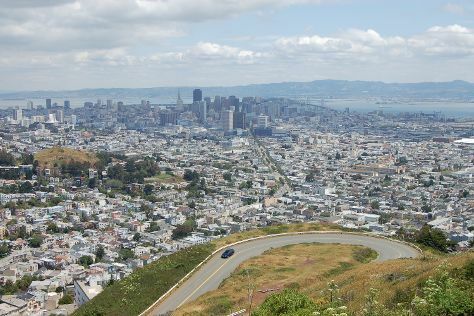 Your list of things to see and do now includes Twin Peaks, Palace of Fine Arts Theatre, Golden Gate Bridge, and other attractions. Kick off your visit on the 25th (Tue): enjoy the scholastic atmosphere at Stanford University, then appreciate the views at Silicon Valley, and then take your sightseeing to a higher altitude at Twin Peaks. On your second day here, see a show at Palace of Fine Arts Theatre, then snap pictures at Golden Gate Bridge, and then explore the world behind art at Legion of Honor. For other places to visit, reviews, more things to do, and other tourist information, go to the San Francisco trip app . Getting from Yosemite National Park to San Francisco by car takes about 4 hours. Other options: take a bus; or do a combination of taxi, bus, flight, and subway. When traveling from Yosemite National Park in December, plan for a bit warmer days and warmer nights in San Francisco: temperatures range from 59°F by day to 45°F at night. Finish up your sightseeing early on the 26th (Wed) so you can travel to Washington DC. Your day-by-day itinerary now includes Smithsonian National Museum of Natural History as well as The National Archives Museum. Start off your visit on the 27th (Thu): see the interesting displays at The National Archives Museum, explore the world behind art at National Gallery of Art, then get a new perspective on nature at Smithsonian National Museum of Natural History, and finally examine the collection at National Air and Space Museum. To see traveler tips, where to stay, and tourist information, you can read our Washington DC road trip app . Getting from San Francisco to Washington DC by flight takes about 7 hours. Other options: do a combination of flight, bus, and subway; or drive. Traveling from San Francisco to Washington DC, you'll lose 3 hours due to the time zone difference. Prepare for slightly colder weather when traveling from San Francisco in December: high temperatures in Washington DC hover around 51°F and lows are around 37°F. On the 28th (Fri), wrap the sightseeing up by early afternoon so you can take a train to Philadelphia. To find maps, where to stay, reviews, and tourist information, read Philadelphia day trip planner. Traveling by train from Washington DC to Philadelphia takes 2 hours. Alternatively, you can drive; or take a bus. In December, daily temperatures in Philadelphia can reach 48°F, while at night they dip to 35°F. Finish your sightseeing early on the 28th (Fri) to allow enough time to take a bus to New York City. To find other places to visit, reviews, ratings, and other tourist information, go to the New York City attractions planner. Traveling by bus from Philadelphia to New York City takes 1.5 hours. Alternatively, you can take a train; or drive. In December in New York City, expect temperatures between 48°F during the day and 36°F at night. On the 29th (Sat), you'll travel to Boston. On the 29th (Sat), explore the galleries of The House of the Seven Gables, then get to know the fascinating history of Freedom Trail, then get up close to creatures of the deep with a dolphin and whale watching tour, and finally take in the architecture and design of Harvard University. To find photos, ratings, and tourist information, go to the Boston trip planner. You can do a combination of flight and bus from New York City to Boston in 3.5 hours. Alternatively, you can do a combination of bus and flight; or drive. Plan for a bit cooler temperatures traveling from New York City in December, with highs in Boston at 43°F and lows at 31°F. Cap off your sightseeing on the 30th (Sun) early enough to travel to Jersey City. Jersey City is the second-most-populous city in the U.S. You can plan Jersey City trip in no time by asking Inspirock to help create your itinerary. Do a combination of bus, flight, and train from Boston to Jersey City in 3.5 hours. Alternatively, you can do a combination of bus, flight, and train; or drive. Expect a daytime high around 48°F in December, and nighttime lows around 36°F. On the 30th (Sun), you're off toDeath Valley National Park.